In 1973, with new responsibilities, he became an Atlanta Police Officer while attending college full time. Ron attained a BA degree in English Literature from Georgia State University in 1974. He retired from the Atlanta Police Department in 1996 after a very fulfilling and personally satisfying career. 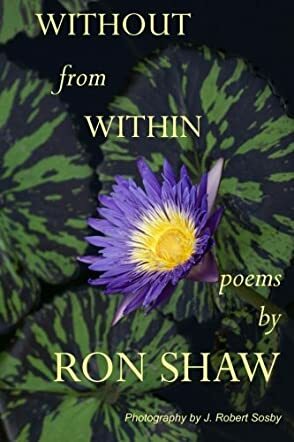 Without From Within: Poems by Ron Shaw is a collection of 43 poems that gives readers a peek into the heart and soul of the poet. The entire collection reveals a wide range of emotions, from pain to pleasure to loneliness to his observations on life and his surroundings. The sensitive journey of the poet and the visual ideas that he conveys through his poems leave the deepest of impressions upon readers, making them ponder upon life and the emotions surrounding them. The poetic value in his writings stands out; so do the sentiments and the intriguing images, making it an engaging collection. All the photographs at the beginnings of the poems give an aesthetic effect to the book. There are poems for everyone in this collection. Ron Shaw’s style of writing and expressions are stark, sublime, and all the poems are thought provoking. These are heartfelt renditions of the poet’s inner self and readers can connect well with his thoughts and feelings. Many poems are of a cryptic nature, for example, ‘Invisible,’ and will make readers want to read it many times because it can be interpreted in different ways. It’s difficult to choose a favorite poem as they all deal with different feelings and emotions, and are wonderful and vibrant both in content and form. All the poems evoke sensations, sights, and sounds, and readers will experience an immense feeling of satisfaction trying to interpret each piece. The blending of a realistic and an imaginative approach in the poems works well and gives the collection a real and surreal feel. An engaging collection that will make readers reflect upon life.